Nest Labs developed/acquired the Wi-Fi enabled Nest Learning Thermostat, the Nest Protect Smoke+CO detector, and the Nest Cam. These devices are supported by this binding, which communicates with the Nest API over a secure, RESTful API to Nest’s servers. Monitoring ambient temperature and humidity, changing HVAC mode, changing heat or cool setpoints, monitoring and changing your “home/away” status, and monitoring your Nest Protects and Nest Cams can be accomplished through this binding. In order to use this binding, you will have to register as a Nest Developer and register a new Product (free and instant). Make sure to grant all the permissions you intend to use. When in doubt, enable the permission, because you will otherwise have to reauthorize the binding if you later have to change the permissions. Leave the Redirect URI field blank for PIN-based authorization. At this point, you will have your client_id (Product ID) and client_secret (Product Secret). Once you’ve created your product as above, paste the Authorization URL into a new tab in your browser. This will have you login to your normal Nest account (if not already logged in), and will then present the PIN. Prepare to copy and paste your values for client_id, client_secret and pin_code in order to configure the binding. This binding can be configured in the file services/nest.cfg. The syntax for the Nest item configuration string is explained below. Nest bindings start with a symbol character to indicate if the item receives values from the API (in binding <), sends values to the API (out binding >), or both (bidirectional binding =). where <property> is one of a long list of properties than you can read and optionally change. See the list below, and then read the Nest API Reference for all specifics as to their meanings. To reiterate, you could change the display names of your devices at nest.com, and thereby avoid having to put escaped versions in your binding configuration strings. When you update or send a command to the item with one of the five possible valid strings, you will change the HVAC mode. Below are some examples of valid binding configuration strings, as you would define in the your items file. The examples represent the current set of available properties, and for each property, the example shows if it is an in-binding (<) only (read-only), an out-binding (>) only (write-only), or a bidirectional (=) (read/write) binding only. Note, however, that if a read/write property is only authorized for read-only access in the Nest Product you authorized, an attempt to change its value will fail. In this example, there is a Nest structure called Home, a Thermostat called Upstairs, a Smoke/CO Sensor called Master Bedroom and a Nest Cam called Dining Room. * same structure, or duplicate-named structures, you will have to rename them at nest.com. The contents of nest.items and nest.sitemap demonstrate a possible user interface that’s backed by the Nest binding. 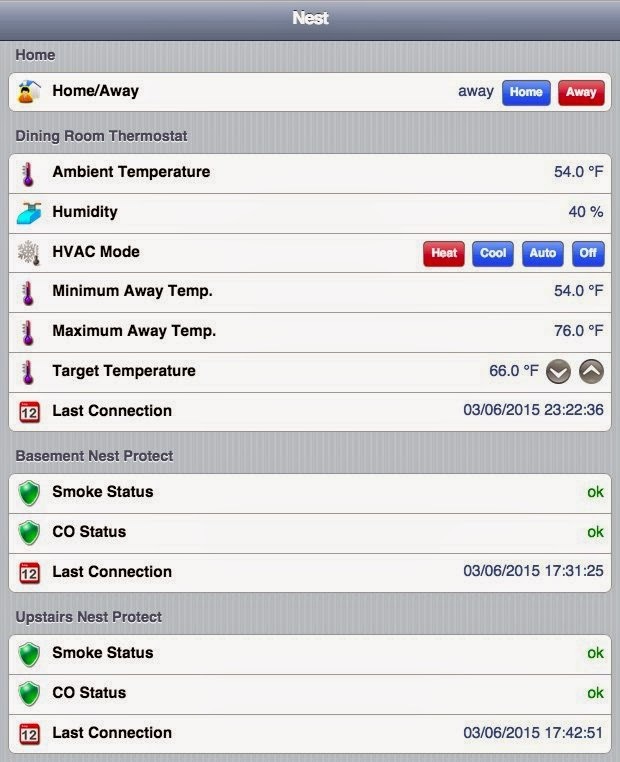 The items file assumes your structure is called “Home,” your thermostat is called “Dining Room,” and you have two Nest Protects called “Upstairs” and “Basement.” Change these to match how your devices are named at nest.com. The sitemap will show the ambient temperature in the same scale (C or F) that the thermostat is set to. It will only show the away temperature range if the structure is currently in away mode. It will show the single setpoint if the thermostat is either in “heat” or “cool” mode, or will show the low and high setpoints if the thermostat is in “heat-cool” (auto) mode. The smoke+CO detectors show their status colors in the same color as the Nest Protect’s light ring. This rule assumes that the windows are all Contact Items, are all in a Group called GWindow, and that the members are Bedroom2ZoneTripped … StairsWindowsZoneTripped per the list below. As the counterpart of the above rule, set the Thermostat to home once all the windows are closed. The binding initiates outbound TCP connections to the Nest infrastructure on port 9553 (however, which outbound ports are used is determined dynamically by the Nest cloud service and may be different from 9553). If the log shows “Connection timed out” or “Exception reading from Nest: Could not get data model”, ensure that outbound connections are not being blocked by a firewall. The Nest API rounds humidity to 5%, degrees Fahrenheit to whole degrees, and degrees Celsius to 0.5 degrees, so your Nest app will likely show slightly different values from what is available from the API.